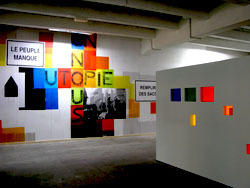 The 10th Biennale de Lyon, which runs until January 3, 2010, takes a particularly intense look at the ordinary things that we often overlook, and it establishes an unusual dialogue between a promising group of international artists and the vast public that is often ignored by the establishment. The official theme is Le Spectacle du Quotidien, "The Spectacle of the Everyday." The Biennale, conceived as an integral part of Lyon and its neighboring areas, presents more than 60 international artists most of them in their 40s. The major exhibitions are concentrated at four locations in the city. In addition, Résonance, a series of 150 events, is being held at 90 different spaces in the Rhône-Alpes region. everyday life) lead to a reflection on social, political, cultural and environmental issues. The exhibitions are at La Sucrière (a former sugar factory and warehouse at the Docks on the Rhône River), The Museum of Contemporary Art, the Bichat Warehouse, and the Bullukian Foundation. the Biennale's artistic director, Thierry Raspail, who is also the director of Lyon's Museum of Contemporary Art, have planned their exhibitions around an important theme. "We perceive the world and communicate with each other through the spectacle," says Hou Hanru. He explains that the spectacle is: "a system of image production and representation dominated by the logic of market capitalism which tends to 'develop' our faculties of perception, imagination and reflection towards a 'one-dimensional model' formatted by the language of consumerist ideology." 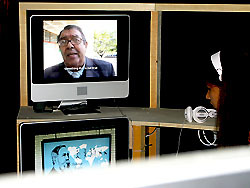 Thierry Raspail points out that computerized globalization has left the 20th century with overlapping cultural models. Raspail quotes the famous Gertrude Stein metaphor, "There is no there there." Instead, Raspail explains, "there are only fluctuating 'heres.'" Raspail continues, "There is no longer any outside and there are no longer any exoticisms, except shared ones...as a result, the art of imagined worlds is turning towards the everyday and the ordinary." Hou Hanru and Thierry Raspail focus on four areas showing how artists enable us to use the spectacles around us to take control of our destiny. 1) The Magic of Things concentrates on artists who appropriate and reinterpret the objects and experiences of our everyday life and show us the potential for a new beauty. 2) Celebrating the Drift deals with the urban environment and the new writing/reading emerging especially in the streets. With globalization, many artists find new spaces, more accessible, to develop strategies that give them more freedom but also put them in a direct dialogue with the everybody evolving in the realm of the everyday. The drift contains at the same time a geographical notion and a political one. More artists are working in collaborative groups, combining different disciplines and nationalities as well. The street is their place of choice to give us the possibility of evolving and becoming a political animal. 3) Another World is Possible is certainly one of the most surprising approaches for a Biennale. "Art for art" is no longer an issue. There is a new map of the world in which the "everywhere" is possible, and in which artists and social activists increasingly look at alternatives to create new social models involving a reflection on democracy. 4) Living Together, mainly installed in the Museum of Contemporary Art, focuses on a dialogue with the city and the communities outside of it. Undeniably, there is a strong Asian presence at the Biennale. As Hou Hanru explains, art takes new dimensions in regions where social, economical and political tensions are particularly fervent. Artists from China, South East Asia, the Middle East and India have strong reasons for questioning their societies and values; and they do it on a large scale, and a visible one that puts them at the forefront when it comes to creativity. These artists are trying to understand their own deeply fractured heritage, largely ignored or ridiculed by colonial powers and by their own regimes that are often brutal. The globalization of financial markets and of communications forces these societies to reflect on their core values. The shift is quite significant. It provides a wealth of material with little in the way of an established structure to shape their expression -though this is changing now with the creation of important national museums and biennales in China, Japan, Korea, and Indonesia. The experiment focuses on a local scale with actors, who are rarely included in any decision-making process, much less one involving art. It is a testimony to the new imagination of artists confronted with the disastrous after effects of the current crisis. The notion of beauty will always be linked with art. But how do you reinvent beauty and create a magical world when you are surrounded by so many human and environmental disasters? Takahiro Iwasaki's sculptures belong to the meditative sphere that Westerners qualify as "Japanese." A "typical" oriental landscape attracts our attention because of the beautiful contrast of the black and the white. What a surprise to discover that the landscape is made of black socks and bath towels! 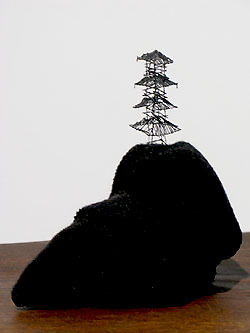 The tiny pagoda erected on this "everyday" material looks ephemeral, nearly virtual. We nearly need a magnifying glass to discover its existence on the edge of a cliff. It is a reminder of our own cultural fragility. 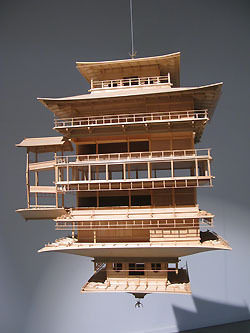 Reflection Model," done in 2001, is a double-axis representation of a Tokyo palace suspended from the ceiling. The lake that should reflect the image of the building is absent: our attention is caught in the mirage of its reflection. Reality extends to the enchanted part of the fantasy world that we still imagine belongs to us.
" Portable Planetarium" is another sculpture that creates strong emotions. 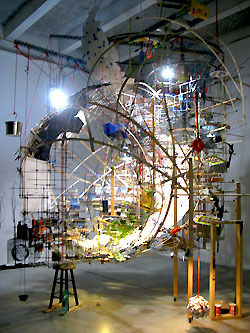 Made in 2009 by Sarah Sze, an American artist born in 1969 in Boston, the sculpture is an incredible accumulation of thousands of small- scale items usually found either in the street or in our household. Sarah Sze creates a relationship between us and the "Portable Planetarium" which is not only at an ephemeral level but also explores our everyday life. The humble material that she uses ranges from a Cuisinart box to thumb tacks, pliers, small plants, photographs, small plastic jars and thousands of other items that surround our daily life. These objects are so banal -but often not so environmental- that we don't pay much attention to them when the time comes to throw them away. The Planetarium is a reflection of ourselves, or at least the representation of the world as a communication system that we are trying to grasp intellectually. Our planet is at stake and Sarah Sze's Planetarium opens to allow us inside to participate in its movements. This fantastic sculpture makes us dream at first, and then leads us to contemplate our own delusions, or at least the items that keep us moving forward into a society of consumerism. Everything moves, animated by a gentle force, nearly a romantic one. The sky is present and an articulated arm illuminates stars on a screen whose reflection appears on the opposite wall as faded reflections of our own dreams. When looking at the "Portable Planetarium," we confront the notions of memory and accumulation. Familiar spaces do not usually get our attention. But when an entire shop is reconstituted in a cultural space, the experience of walking through it becomes a personal and social event. 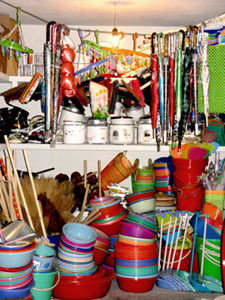 "What a Difference a Day Made," is a composite installation starting with a narrow passage through a tiny Chinese shop whose accumulated products were brought back en masse from Shanghai by the Taiwanese artist Michael Lin. Pots and pans, brooms and dust cloths, rice cookers and instant noodles, accumulated and superposed in layers from the ground to the ceiling, offer an exact image of a practical space where people can go anytime day and night to fulfill their household needs. As we walk through this tiny space, the viewer enters a bigger room where screens show a juggler. Sometimes, an object falls and we can hear the noise of a dish that broke. The noise is an allusion to the objects that we discover neatly presented in wooden crates displayed in an unspecified order. Woks, baskets, plastic buckets...everything from our modest existence is now gracefully arranged as though they were on museum shelves. Objects from our everyday use are catalogued and placed according to function, color, and shape. The "everyday" becomes "spectacle" by connecting us with personal and collective memory, objects and situations. Michael Lin, "What a Difference a Day Made"
The city offers artists new opportunities to dialogue with communities. The flow of ideas, frustrations, constraints, collides with environments that were originally conceived to protect social values. New forms allow us to go beyond spatial constraints and political power. 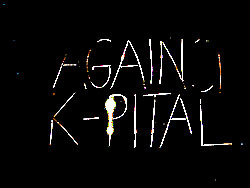 When graffiti emerged from the guts of New York City in the late 1960s and covered deteriorated walls and ramshackle subway cars, a youth expressed -consciously or not- its anger against an establishment that had failed and abandoned them essentially because they were Hispanic and African- American. The movement created new forms of writing. Today, Sao Paulo, a city rapidly expanding to accommodate its population, which is soon expected to reach 25 million, is running short in innovative architectural and urban planning models. The pixaçao was born in the 1960s to confront dictatorship. The pixadores, who often can barely write, represent an assault by the favelas against the cultural and financial ghettoization of the city. These signs of courage and desperation are usually made at night. Each morning, they appear as signs of an infringement against the establishment, although they are really an attempt to communicate with the population. 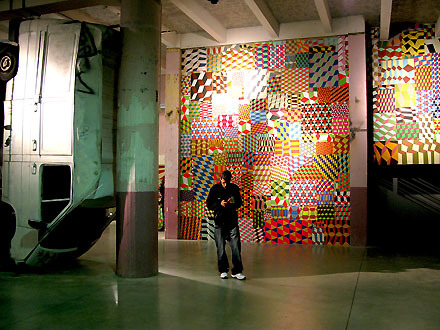 Barry McGee, an artist from San Francisco, also takes inspiration and expression from the city. He started as a street artist, tagging buildings, bridges and doors with his signature "TWIST." Later on, he went to the Art Institute of San Francisco. 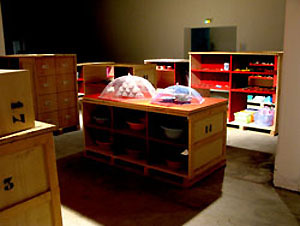 His "Installation" is placed in a large room at La Sucrière, where the elements have space to communicate with each other in a coded language, the language of the street. The work mixes old battered vans covered with graffiti, decorative panels made of bright geometrical patterns, small wooden statuettes nearly coming from the world of cartoons and spraying paint. A bigger, articulated sculpture is composed of three men standing on each other's shoulders, repetitively spraying black paint on a wall. 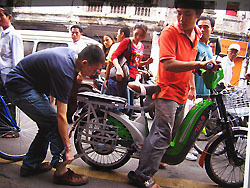 The popular is here with its uneasy environment of people who cannot make it inside the society. Barry McGee himself resisted for a long time having his work shown in galleries and museums. 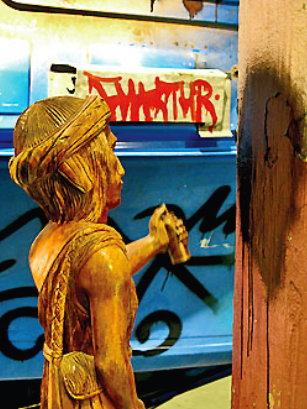 The moment he did, his graffiti images were scavenged or stolen. His urban vision, as he explains, is " a collection of urban ills, frustrations and addictions, and trying to maintain a level head under the constant bombardment of advertising." UN NOUS, "Installation et Affichage"
UN NOUS, a group working as a collaborative, created in France in 2006, proposes an exchange with the city. Its members, Antonio Gallego, Jose Maria Gonzalez, Patrick Pinon and Roberto Martinez question the notions of meeting and connectedness between the city's fabric and its people. 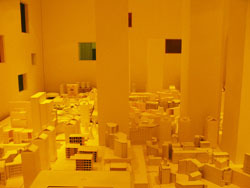 For the Biennale, they have combined an exhibition space with an "audible and luminous utopia,"composed of a big rectangular volume pierced with Plexiglas windows placed at different levels forcing the spectator to either stand on tip-toe or bend over to be at eye-level in order to look at a fantastic city inside, a white city composed of everyday objects. Egg boxes, juice containers, old toys, miniature animals, are jumbled next to fragments of models created by architecture students from schools in Versailles, Grenoble, Saint-Etienne and Lyon. These models were destined to be demolished. The city "inside the box" will never exist but the fantasy it creates with sounds and lights belong already to our visionary future. The perfect white -inside and outside-is regularly disturbed by sudden noises that unleash patterns of light. Green, yellow, red, blue, orange color the Plexiglas windows blurring our vision, making the image of the city less sharp, although it is still there but now more and more inaccessible, and for some, more dream-like. The sound track is composed of various noises taken from musical elements from the 18th through the 20th century. It is not the "I" that is questioned here but our position in "relation-with." This urban utopia is surrounded by walls, covered with posterish slogans and images. UN NOUS also pasted their graphic works in various parts of Lyon as an echo of their quest for interaction with a broader public. With his "Graffiti Cut," Carlos Motta, the Columbian artist born in 1978 in Bogota, positions small graffiti next to each other on a wall-like structure painted black and located in a darkened room. The words and short sentences that we discover here are real slogans that the artist copied from walls in various cities. Placed out of context, they act as banners through which light emerges. The slogans glow lightly in the dark of our unconsciousness. They require our attention to be deciphered. By documenting the feelings that affect people the most -God, oppression, torture, money, capitalism-in the misery of their daily life, Carlos Motta creates an archival monument to the Unknown of the Street. Carlos Motta, "The Good Life"
In another project but this time at the Museum of Contemporary Art, the same artist, invites us to sit and take our time to watch over 400 interviews made with passers-by in the streets of twelve Latin- American cities. "The Good Life (2005)," records people's sentiment over American interventionism and their own government. It is a cry for democracy as perceived by ordinary people. In parallel, Oliver Ressler asked the question "What is Democracy?" to people from cities around the world, including Amsterdam, Sydney, New York, Tel Aviv. Their answers are shown on eight video screens, composing a mosaic of opinions and attitudes questioning existing democracies and their survival. The two projects, Motta's and Ressler's, are placed in the same room divided only by a small partition that helps us to go back and forth between the two models. On the one hand you have powerful parliamentary democracies, which can substitute themselves for individual initiative, and on the other you have emergent voices of people trying to create an indigenous system. The dialogue is not an easy one, but without it our daily life can be reduced once again by exploitation of the spectacle. In that spirit, two artistic experiments are related in their approach to the "other." 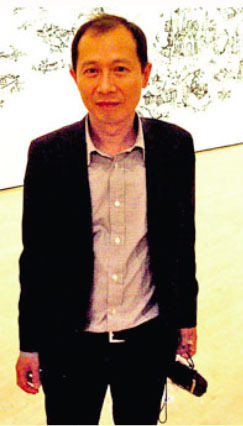 Lin Yilin, a Chinese artist from Mainland China, spends his time between Guangzhou and New York. 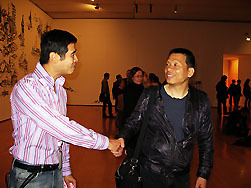 At La Sucrière, he presents 37 photographs and two videos focused on an event that marked the artist "One Day" in 2006 in the streets of Guangzhou. Lin Yilin saw two young men walking on a crowded street. One was a plainclothes policeman and the other a petty thief, who was bent over nearly double because his wrist was handcuffed to his ankle. Lin Yilin was struck by the indignity of the situation, and by the fact that people looked at the scene without intervening. Shocked by what he saw as a lack of compassion, Lin Yilin, hired an actor to reenact the scene in public in China, and had the scene videotaped. No one seemed to bother or ask what was going on. The lack of a connection is striking in the busy life of cities and reveals what appears to be a lack of humanity. Lin Yilin reenacted the same event himself at the Tomb of the Unknown Soldier at Paris' Arc de Triomphe, and the results were the same except that eventually two French police officers asked the artist to stage his happening at a different location. In both countries, the conclusion was the same, that there are certain scenes that we choose not to question in our everyday life, not even in Western democracies. If we were to do so, we would cross the boundaries from being a spectator to becoming an actor in our own tragedy. Lee Mingwei, "The Moving Garden"
In contrast, Lee Mingwei puts us in a situation where a simple gesture enables us to communicate with others. The Taiwanese artist, who lives in New York, works with the symbolism of our daily life. 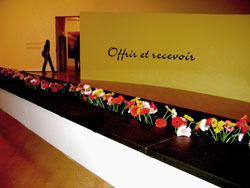 "The Moving Garden," exhibited at the Musée d'Art Contemporain, is an installation composed of a long, narrow, granite table on which fresh flowers are placed every day. The visitor is invited to pick-up a flower with two conditions: he or she must give the flower to a complete stranger and this must be done outside the exhibition. These conditions seem easy enough because they involve doing something that is nice and related to pleasure. But at the exhibition, some people instinctively gave the flower to a friend or a spouse rather than looking for a stranger. Others did follow Lee Mingwei's instructions, and offered the flower to a passer-by in the street. I gave mine, which I received from a young man waiting for the bus, to the lady at the cloakroom of La Sucrière the night of the opening. In Lee Mingwei's installation, the act of giving and receiving involves bringing people together, and to do that we must connect with our "I" in order to relate to the " we." It is an act, which epitomizes the Biennale, when alternative visions of the world come from the gestures of ordinary people, who perceive themselves in their human and cultural universalism. This article was first published in the internet magazine The Essential Edge. Michèle Vicat is one of the arts editors for The Essential Edge.